Choosing the perfect gift for children at Christmas time is never easy. There’s a dizzying selection of toys, games and gadgets to consider… but how about something a little different for the heavy metal-loving youngster? Well, Don’t Fear The Dark by author Lav Nandlall, could be just what you’re looking for. The answer, says Nandlall, is this first of 11 planned volumes which explores rock and metal from the 60s to the present day. 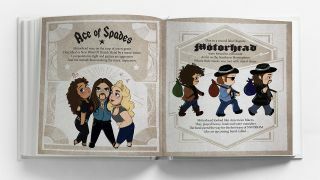 A statement reads: “The eleven books aim to educate young headbangers about a music scene that is often overlooked in society as well as inform the ‘littles’ that there’s nothing to fear about metal music. “The book appeals to tiny tots and metal music lovers who love a good slash of alternative history. “There aren’t many commercial books on the topic of metal music nor are there any books for younger audiences, so this is a first of its kind. It opens discussions about musical inspiration, artistic careers, style statements, adventure, and the macabre. Nandlall has teamed up with South African artist Kaylee McHugh for the project, while the layout was devised by designer Jeanine Breuer. Those interested are asked to contact Lav Nandlall directly.